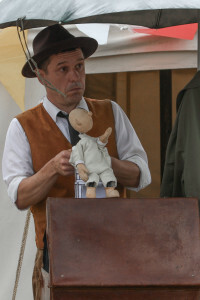 A FROME puppet theatre company will be taking its show to Indonesia, to appear at the World Puppet Carnival next month. Nik Palmer, Sarah Rowland-Barker and ‘Plain Bob’ of Noisy Oyster will be among artists from over 40 countries at the Wayang World Puppet Carnival 2013, the biggest puppet carnival in the world. Nik and Sarah have already performed at several festivals across Europe, but they are particularly excited about travelling to Indonesia, a country with its own traditions and heritage in shadow puppet theatre. The duo will take their loveable character ‘Plain Bob,’ in a show that they have chosen to suit the occasion. They explain, “There is no language in the show, so it is easily accessible to non-English speaking audiences. It involves quite a lot of audience participation, which is always fun. “The show comes across as quite simple but beneath the plain exterior there is quite a lot going on, Sarah triggers all the music and sound effects discretely and wirelessly from the audience using an iPhone app and at times Bob is hooked up so that Sarah can control him via radio control. The unexpected finale of the show is when it rains inside the large umbrella which covers the small stage. Nik and Sarah have been working together for eight years, performing locally and at festivals at home and abroad. They have made appearances at Glastonbury Festival, Skipton Puppet Festival, and travelled to the Czech Republic and Denmark among many others. The duo say they feel lucky that they can use their creative talents to bring a smile to audiences’ faces. “We make all of our own puppets, props and sets which involves a wide range of craft skills which is fun. But unlike traditional craftspeople, we get paid to show off our work and get to keep the things we have made, not sell them. You get a tremendous amount of satisfaction seeing people smile and laugh at things you have created. “We have fantastic travel experiences, and we often get to see a different side to places, meeting and staying with local people.